The ASAM MCD-2 MC standard, also known as ASAP2, is a data definition standard proposed by the Association for Standardization of Automation and Measuring Systems (ASAM). ASAP2 is a non-object-oriented description of the data used for measurement, calibration, and diagnostic systems. For more information on ASAM and the ASAM MCD-2 MC (ASAP2) standard, see the ASAM Web site at https://www.asam.net. The code generator lets you export an ASAP2 file containing information about your model during the code generation process. Simulink® Coder™ support for ASAP2 file generation is version-neutral. By default, the software generates ASAP2 version 1.31 format, but the generated model information is generally compatible with all ASAP2 versions. ASAP2 file generation also is neutral with respect to the specific needs of ASAP2 measurement and calibration tools. The software provides customization APIs that you can use to customize ASAP2 file generation to generate an ASAP2 version and to meet the specific needs of your ASAP2 tools. ASAM and the ASAP2 standard and terminology. See the ASAM Web site at https://www.asam.net. Simulink data objects. Data objects are used to supply information not contained in the model. For an overview, see Data Objects (Simulink). Storage and representation of signals and parameters in generated code. See Data Access for Prototyping and Debugging. If you are licensed for Embedded Coder®, see also the Embedded Coder topic Data Representation and Access (Embedded Coder). Generic Real-Time Target (grt.tlc) lets you generate an ASAP2 file as part of the code generation and build process. Embedded Coder (ert.tlc) system target file selections also let you generate an ASAP2 file as part of the code generation and build process. ASAM-ASAP2 Data Definition Target (asap2.tlc) lets you generate only an ASAP2 file, without building an executable program. Procedures for generating ASAP2 files by using these target configurations are given in Generate an ASAP2 File. The ASAP2 file generation process requires information about parameters and signals in your model. Some of this information is contained in the model itself. You must supply the rest by using Simulink data objects in a workspace or data dictionary. In some cases, the use of workspace objects is optional. You can use the Model Data Editor and built-in Simulink data objects to provide the information. For example, you can use Simulink.Signal objects to provide MEASUREMENT information and Simulink.Parameter objects to provide CHARACTERISTIC information. Also, you can use data objects from data classes that are derived from Simulink.Signal and Simulink.Parameter to provide the information. For information about data objects, see Data Objects (Simulink). For information about the Model Data Editor, see Configure Data Properties by Using the Model Data Editor (Simulink). The following table contains the minimum set of data attributes required for ASAP2 file generation. Some data attributes are defined in the model; others are supplied in the properties of objects. For attributes that are defined in Simulink.Signal or Simulink.Parameter objects, the table gives the associated property name. If the memory address attribute is unknown before code generation, the code generator inserts ECU Address placeholder text in the generated ASAP2 file. You can substitute an actual address for the placeholder by postprocessing the generated file. See the file matlabroot/toolbox/rtw/targets/asap2/asap2/asap2post.m for an example. asap2post.m parses through the linker map file that you provide and replaces the ECU Address placeholders in the ASAP2 file with the actual memory addresses. Since linker map files vary from compiler to compiler, you might need to modify the regular expression code in asap2post.m to match the format of the linker map you use. If Embedded Coder is licensed and installed on your system, and if you are generating Executable and Linkable Format (ELF) or Program Database (PDB) files for your embedded target, you can use the rtw.asap2SetAddress function to automate ECU address replacement. 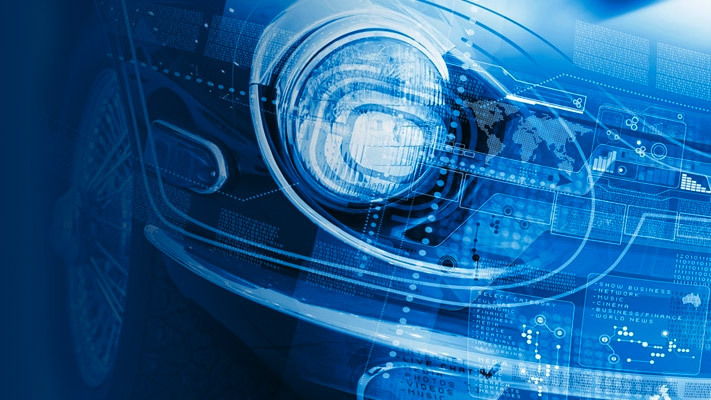 For more information, see Automatic ECU Address Replacement for ASAP2 Files (Embedded Coder). If the memory address attribute is known before code generation, it can be defined in the data item or data object. By default, the MemoryAddress_ASAP2 property does not exist in the Simulink.Signal or Simulink.Parameter data object classes. If you want to add the attribute, add a property called MemoryAddress_ASAP2 to a custom class that is a subclass of the Simulink or ASAP2 class. For information on subclassing Simulink data classes, see Define Data Classes (Simulink). In previous releases, for ASAP2 file generation, you had to define objects explicitly as ASAP2.Signal and ASAP2.Parameter. This is no longer a limitation. As explained above, you can use built-in Simulink objects for generating an ASAP2 file. If you have been using an earlier release, you can continue to use the ASAP2 objects. If one of these ASAP2 objects was created in the previous release, and you use it in this release, the MATLAB Command Window displays a warning the first time the objects are loaded. If Embedded Coder is licensed and installed on your system, and if you are generating Executable and Linkable Format (ELF) or Program Database (PDB) files for your embedded target, you can use the rtw.asap2SetAddress function to automate the replacement of ECU Address placeholder memory address values with actual addresses in the generated ASAP2 file. If the memory address attribute is unknown before code generation, the code generator inserts ECU Address placeholder text in the generated ASAP2 file, as shown in the example below. /* Long Identifier */ ""
For table data, use a Simulink.Parameter data object with a non-Auto storage class. For tunable breakpoint data that is shared among multiple table axes (COM_AXIS), use a Simulink.Parameter data object with a non-Auto storage class. For fixed, nontunable breakpoint data (FIX_AXIS), use workspace variables or arrays specified in the block parameters dialog box. The breakpoints should be stored as integers in the code, so the data type should be a built-in integer type (int8, int16, int32, uint8, uint16, or uint32), a fixed-point data type, or an equivalent alias type. Create a Simulink.Bus object to define the struct packaging (names and order of the fields). The fields of the parameter structure must correspond to the lookup table data and each axis of the lookup table block. For example, in an n-D Lookup Table block with 2 dimensions, the structure must contain only three fields. This bus object describes the record layout for the lookup characteristic. Create a Simulink.Parameter object to represent a tunable parameter. Create table and axis values. Optionally, specify the Units, Minimum, and Maximum properties for the parameter object. The properties will be applied to table data only. The example model rtwdemo_asap2 illustrates ASAP2 file generation for Lookup Table blocks, including both tunable (COM_AXIS) and fixed (FIX_AXIS) lookup table breakpoints. Use the Generic Real-Time Target or a Embedded Coder target to generate an ASAP2 file as part of the code generation and build process. Use the ASAM-ASAP2 Data Definition Target to generate only an ASAP2 file, without building an executable. This section discusses how to generate an ASAP2 file by using the targets that have built-in ASAP2 support. For an example, see the ASAP2 example model rtwdemo_asap2. Use the Model Data Editor (View > Model Data Editor) to apply storage classes to signals, block states, and block parameters as described in Apply Storage Classes to Individual Signal, State, and Parameter Data Elements. Use signal and state names to refer to corresponding MEASUREMENT records and parameter object names to refer to CHARACTERISTIC records. Use a storage class or custom storage class other than Auto, FileScope, or, if you set the default storage class of the corresponding data category to Default in the Code Mapping Editor (the default setting), Model default. For example, using ExportedGlobal configures the data item as an unstructured global variable in the generated code. You apply one of the storage classes Auto, FileScope, or Default (through Model default). You apply a custom storage class that causes the code generator to generate a macro or non-addressable variable. Use the Model Data Editor to configure the remaining properties as desired for each data item. On the Code Generation pane, click Browse to open the System Target File Browser. In the browser, select grt.tlc or an ERT based target file and click OK.
On the Code Generation > Interface pane, in the Data exchange interface subgroup, select ASAP2 interface. Select the Generate code only check box on the Code Generation pane. The code generator writes the ASAP2 file to the build folder. By default, the file is named model.a2l, where model is the name of the model. The ASAP2 setup file controls the ASAP2 file name. For details, see Customize Generated ASAP2 File. On the Code Generation pane, click Browse to open the System Target File Browser. In the browser, select asap2.tlc and click OK. 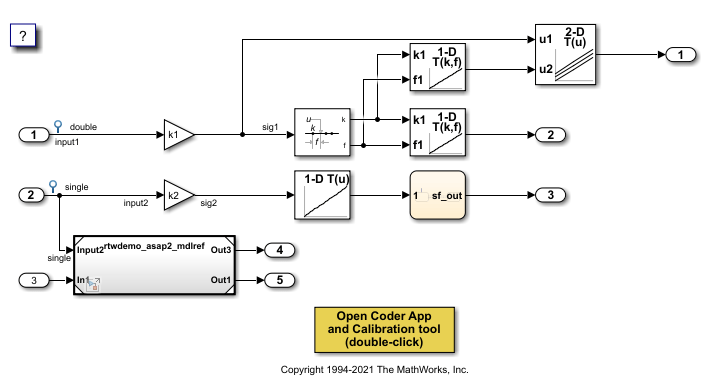 The Simulink Coder code generator writes the ASAP2 file to the build folder. By default, the file is named model.a2l, where model is the name of the model. The ASAP2 setup file controls the ASAP2 file name. For details, see Customize Generated ASAP2 File. The build process can generate an ASAP2 file for each referenced model in a model reference hierarchy. In the generated ASAP2 file, MEASUREMENT records represent signals and states inside the referenced model. To generate ASAP2 files for referenced models, select ASAP2 file generation for the top model and for each referenced model in the reference hierarchy. For example, if you are using the Generic Real-Time Target or an Embedded Coder target, follow the procedure described in Use GRT or ERT System Target File for the top model and each referenced model. topModelName is the name of the model containing one or more referenced models. asap2FileName is the name you specify for the merged ASAP2 file. Optional:: status returns false (logical 0) if the merge completes and true (logical 1) otherwise. Optional:: info returns additional information about merge failure if status is true. Otherwise, it returns an empty character vector. This command merges the ASAP2 files generated for the top model myTopMdl and its referenced models in the file merged.a2l. The example model rtwdemo_asap2 includes an example of merging ASAP2 files. Static parts of the ASAP2 file are shown in bold. Function calls are indicated by %<FunctionName()>. This model shows ASAP2 data export. ASAP2 is a data definition standard proposed by the Association for Standardization of Automation and Measuring Systems (ASAM). Open the example model rtwdemo_asap2. ASAP2 is a non-object-oriented description of the data used for measurement, calibration, and diagnostics systems. For more information on ASAM and the ASAP2 standard, see the ASAM Web site: https://www.asam.de. ASAP2 data definition is achieved with Simulink® data objects and test point signals. Using the Target Language Compiler (TLC), you can create highly customized solutions for your application. See the Simulink Coder® documentation for details on ASAP2 file generation. You can configure ASAP2 file generation by selecting ASAP2 interface on the Code Generation > Interface pane of the Configuration Parameters dialog box.